SQuire Rushnell and Louise DuArt. A tangled legal dispute between an Island couple and a one-time resident who held herself out as a public relations expert that has spanned courtrooms from Edgartown to Texas came to an apparent end last week with a ruling from a U.S. Bankruptcy Court judge. The ruling found that Danielle Pendergraft and her husband Scott Pendergraft owe some $43,000 to Network of Neighbors, a Martha’s Vineyard charity formed in 2011 by SQuire Rushnell and Louise DuArt. Lemonade stand fundraising, a benefit concert by comedian Tim Conway, candy for the Christmas in Edgartown parade, lawsuits and counter lawsuits all figure in the saga between Network of Neighbors and the Pendergrafts that goes back for more than five years, with enough twists and turns to be worthy of a movie script. 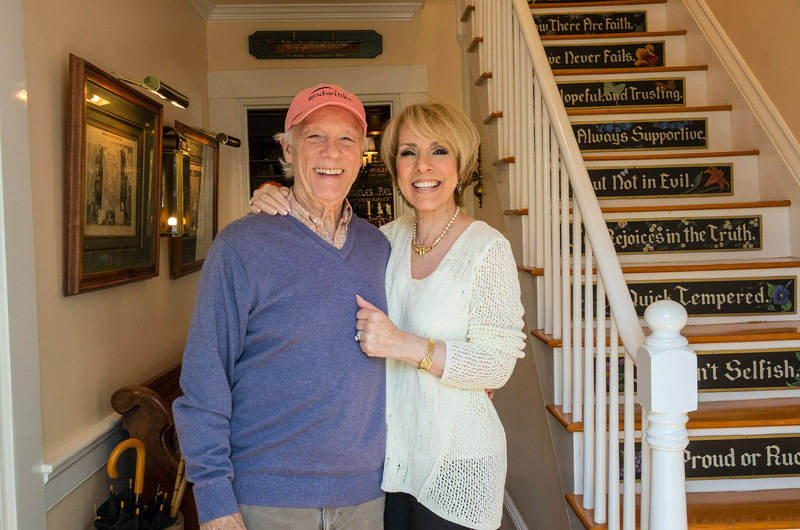 In fact Mr. Rushnell, a retired network television executive, and Ms. DuArt, a comic actress and impersonator, wrote and performed a humorous play about it — mostly, they said this week, to heal their own personal trauma. Titled Betrayed, the play did not use real names, but it nevertheless sparked a lawsuit when Ms. Pendergraft sued for defamation. The case was later thrown out. “This we believe is the end of the saga,” Mr. Rushnell told the Gazette by phone as he and his wife made one of their daily strolls around Edgartown, where they live in a yellow clapboard cottage on picturesque Davis Lane. As recounted in the latest set of court documents filed with the U.S. Bankruptcy Court in Houston, Texas, the saga began in 2010. That was the year the Pendergrafts moved to Edgartown, renting a house in a genteel neighborhood on South Water street. Mr. Rushnell and Ms. DuArt were starting a web-based nonprofit dedicated to fostering small acts of kindness among neighbors. They met the Pendergrafts at a social function. Mrs. Pendergraft claimed to own a business called Holiday Public Relations based in Houston, and said she was opening an office in Edgartown. She and her husband claimed to hold a children’s trust worth more than $10 million. In early 2011, Network of Neighbors was formed, with Mr. Rushnell as president. The Pendergrafts were invited to join the board. Scott Pendergraft became treasurer. Two years later the Pendergrafts, who had become active in Edgartown civic affairs, especially fundraisers, were at the center of a small storm of controversy surrounding various activities, including their dealings with Network of Neighbors. Holiday had filed a lawsuit against the nonprofit in Texas district court claiming breach of contract and seeking $43,000 for work performed. It was not the first time the Pendergrafts had sued an Edgartown nonprofit — a year earlier Mrs. Pendergraft had sued the Edgartown Library Foundation in federal court over the rights to the slogan “Frankly We Love the Library,” used to promote a Labor Day fundraiser and picnic with hot dogs. That case was later settled. In the case with Network of Neighbors, it came to light that Mrs. Pendergraft had a prior criminal record for fraud. In 1996 Mrs. Pendergraft, who was then named Danielle Pauline Ravitch, had pleaded guilty to nine federal charges in connection with the use of false Social Security numbers. The dispute between Network of Neighbors and the Pendergrafts wound its way through courts and eventually became a topic for consideration by U.S. Bankruptcy Court for the southern district of Texas Houston division, where the Pendergrafts are listed as debtors in case number 09-31423-H5-7. In simple terms, Network of Neighbors, represented by a Houston attorney, came before the bankruptcy court seeking payment of $43,486 they believe is still owed to them by the Pendergrafts. The Pendergrafts were seeking to discharge the debt along with others, as part of their bankruptcy proceeding. Documents filed with the court outlined various sums paid to the Pendergrafts for items and services as reimbursement for such things as shirts and cups for the LemonAid BrigAid, a troop of children who manned lemonade stands to raise money for Network of Neighbors, candy for the Christmas in Edgartown parade and posters for the Conway event. In most cases, there was no evidence that vendors were ever paid. A two-day trial was held last October. In a 13-page opinion issued May 11, the Hon. Karen K. Brown ruled that the debt cannot be discharged due to defalcation, a bankruptcy term for larceny or embezzlement. Mr. Rushnell and Ms. DuArt both said this week they do not expect to see the money returned, but are relieved to have the drawn-out turmoil come to an end. “We feel vindicated,” Ms. DuArt said. He said Network of Neighbors will now fold its tent for lack of funds, but noted the irony. “Our little 501c3 was destroyed . . . but the literal network of neighbors that grew up on the Vineyard, in Texas and elsewhere has become a small army of friends who have banded together against evil in their neighborhood,” he said. He said Mrs. Pendergraft acted as her own attorney in the case. He also said the Pendergrafts are now living in Cary, N.C. Very apropos picture next to your staircase expressing that Love...rejoices in truth. Journalist need to learn how to tell a story. It took me reading more half the article before I even got any concept of what happened. If I had the time, I would need to review this article several times, before I would ever understand what happened. Stop showing off your writing talents, and lay the facts out in the beginning of the story. Most of us don't have time to read an article a few times. I, too, had to read the article twice to understand the dispute. Lesson learned. It's called background check before you invite people to join your board. Hi Deborah, true...everyone should do a background check which we did. There were no red flags with Danielle Pendergraft. We only later found out that Danielle had served time in federal prison for white collar crime for 3 years. However her name at that time was Danielle Pauline Ravitch which never showed up on any background checks. Goes to show that background checks don't always give you the truth about someone. Con artists are like chameleons. They change their colors but not their patterns. When new people show up in town and make lots of noise...be suspicious. This isn't the Hamptons but the locals continue to fall for the con jobs. FYI, to anyone that has been following the case these past five years, last week the Pendergrafts filed a Motion for New Trial and to Recuse the Judge, alleging all sorts of things against the Judge and complaining about me "screaming" at Scott Pendergraft during my cross-examination of him at trial (a fair depiction). Congratulations on a job well done! Has anyone checked around in Cary, NC to see what scams they are now performing? Maybe let the local media there know who they are and all of their history? People like this always keep doing the same thing over and over. They just move to a different location! I actually live in Cary and am terrified what these terrible people are going to do to our city. I already saw a gofundme was set up because Scott Pendergraft had died, raising almost $1000. I'm now thinking this was a scam! Yesterday, Judge Karen Brown denied the Pendergrafts motion to recuse her and have a new trial.